During the winter I often make a bean and vegetable chilli and eat it with some soft polenta and tofutti sour cream. It is one of those nice “stay at home, snuggle under a rug and watch some trashy TV” kind of meals. Spring here in Melbourne has been its usual fickle self, with days ranging from freezing to fairly hot, so this dish got an outing on one of the more grim days just when I thought winter food was over. When making chilli dishes in the past I have often just used some generic powdered dried chilli. This year I went mad and bought about a zillion kinds of whole dried south-west American and Mexican chillis: California, Ancho, Chipotle, New Mexico, Pasilla and Mulato, after a friend gave me a gift voucher for the wonderful Gewurzhaus in Carlton. There is a whole world of chillies out there and I’d just been eating chilli powder. The chillis I bought are, for the most part, all fairly mild. Some have a bit of heat, but they have other flavours that are really great in a chilli, ranging from sweet to chocolatey to smoky. They’ve made the comfort food I love just a little bit classier with their complex flavours. As I wrote about recently in another post, I volunteer at the wonderful food rescue, hunger fighting organisation called FareShare. A few weeks ago I was lucky enough to cook up a VAST batch of bean and vegetable chilli using a recipe that I made up on the spot using the vegetables available. I ended up making enough to make 600 vegan meals that will be finding their way to feed hungry people. 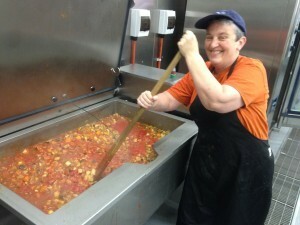 Here’s a photo of me looking not very fetching in a baseball cap, stirring a couple of hundred litres of chilli. Hard work! It is really astonishing cooking on this scale and I found myself laughing as we threw in handfuls of cumin and chilli and garlic! Heat the olive oil over a medium heat and fry the garlic until it starts to smell nice. Do not burn. Add the chopped chillis, cumin and fry a bit more for 30 seconds. Add the tomatoes along with a bit of water to rinse the can. Add the oregano and a pinch of salt to taste. Cook for 20 minutes to reduce and sweeten, adding water as needed. Taste again and if it is too tart, add a pinch of sugar. Add the drained and rinsed beans and heat for 5 minutes. Just before serving add the corn and roasted pumpkin taking care not to break it up. Leave it to warm through. Serve with soft polenta, garnished with the coriander. 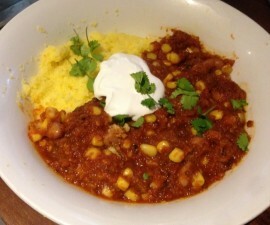 This chilli goes well with a soft polenta. It is also great in a tortilla with guacamole, some vegan cheese and sour cream. I've kept the spicing fairly mild, so if you're a chilli lover add more. I’m impressed by the smorgasbord of chillies you’ve purchased! Wouldn’t mind seeing a post just about them for comparison purposes. Good idea, but sadly I’ve used most of them up now! I love them, some are really chocolatey and raisiny. They really do make a quick chilli more classy. I’ll need to get some more and photograph and blog.